For other uses, see Potpourri (disambiguation). Not to be confused with Popery. 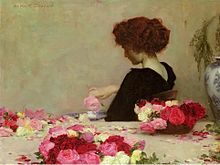 Painting of a woman making potpourri by Herbert James Draper, 1897. Potpourri /ˌpoʊpʊˈriː/ is a mixture of dried, naturally fragrant plant materials, used to provide a gentle natural scent, commonly in residential settings. It is often placed in a decorative bowl The word "potpourri" comes into English from the French word pot-pourri. The French term has two connotations. It is the French name for a Spanish stew with a wide variety of ingredients called "olla podrida", a specialty of the town of Burgos. The word was taken and copied by the French military during the Napoleonic occupation of Burgos (1808–1813). The word pot in French has the same meaning as it does in Spanish and English, while the word pourri means rotten. Pot-pourri was used in rooms since ancient times, in a variety of ways, including just scattering them on floors. In early 17th-century France, fresh herbs and flowers were gathered—beginning in spring and continuing throughout the summer. The herbs were left for a day or two to become limp, then layered with coarse sea salt. The aging mixture was stirred occasionally as layers were added to it. Often the mixture would ferment or even mold as the summer went by. In fall, spices would be added to the unsightly grey mix until a pleasant fragrance was achieved. Then, scent preserving fixatives (see below) were added. The finished potpourri was set out in special pots with perforated lids to perfume rooms. Much modern potpourri consists of any decoratively shaped dried plant material (not necessarily from scented plants) with strong natural and synthetic perfumes (and often colored dyes) added, with the scent often bearing no relation to the plant material used. Sometimes, items that do not originate from plants are mixed in with the potpourri, to give it bulk and to make it more aesthetically pleasing. It is possible to spray scents onto potpourri, however, a fixative is needed so that the scent is absorbed for slow release. Generally, orris root is used for this purpose. Dried flowers can last anywhere from two months to 20 years, depending on the chosen blend. Properly made potpourri will last longer when stored in closed container. In ceramics manufacturing, a potpourri vase is a specifically designed for holding potpourri. In the traditional designs, a potpourri container is provided with a pierced fitted lid, through which the scent may slowly diffuse. The porcelain Sèvres pot-pourri vase in the shape of a ship is one of the most spectacular examples from the 1750s and 1760s; Madame de Pompadour owned three of the twelve examples made, ten of which survived. A dried rose. Dried flowers are a common component of potpourris. Look up potpourri in Wiktionary, the free dictionary. Wikimedia Commons has media related to Potpourri. This page was last edited on 11 April 2019, at 11:54 (UTC).